easy to redeem. we got the all day all night pass but the day we redeem our voucher the river is only open until 3pm because of the coronation. 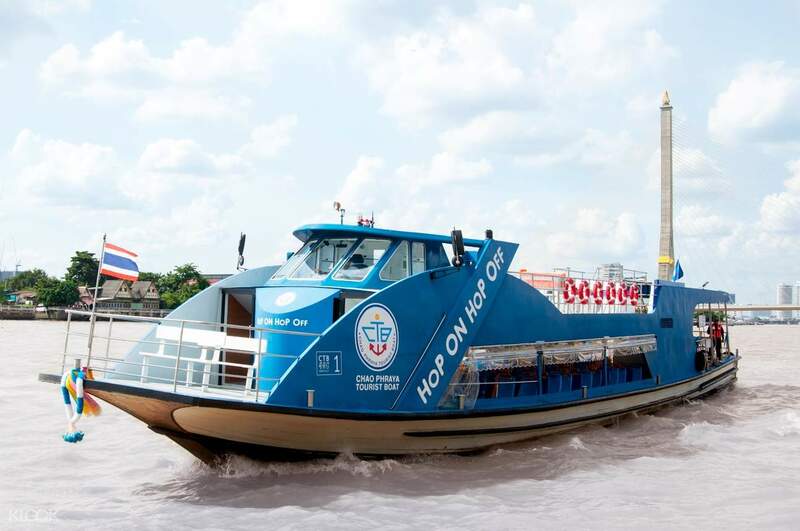 Set off to an exciting adventure in Bangkok with a hop-on hop-off boat day pass along Chao Phraya River! Witness amazing cityscapes on board as you cruise along Thailand’s major river before departing to the destination of your choice. 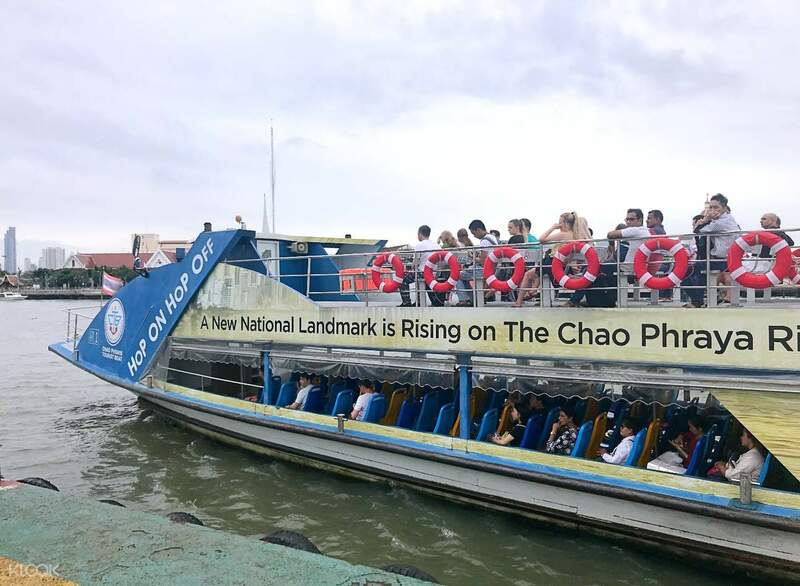 Choose to board or depart from any of the 9 different piers available and hop on and hop off the boat wherever pier you desire - the boat sticks to a rigid schedule scheme so no time will be wasted on waiting! Take seat between the open air top deck to breathe in fresh air whilst basking in the views, or sit comfortably inside the first floor. The tourist boat is more expensive than the normal passenger boats, but it was more comfortable and convenient. They have a lot of staff assisting passengers. They provide some info on possible areas to visit in each stop. At night, we took the boat to the other end, stayed on the boat and enjoyed the whole return trip going to Iconsiam, seeing Grand Palace, Wat Pho and Wat Arun all lit up. We went off at Iconsiam, roamed around the mall a little and just took their free shuttle boat back to Sathorn Pier. The tourist boat is more expensive than the normal passenger boats, but it was more comfortable and convenient. They have a lot of staff assisting passengers. They provide some info on possible areas to visit in each stop. At night, we took the boat to the other end, stayed on the boat and enjoyed the whole return trip going to Iconsiam, seeing Grand Palace, Wat Pho and Wat Arun all lit up. We went off at Iconsiam, roamed around the mall a little and just took their free shuttle boat back to Sathorn Pier. It was a convenient way of exploring major tourist attractions, just walking distance near piers. Just pace/time yourself well, be mindful of the ferry schedule so you'd not be left behind and you'd be able to see the sunset while cruising. Start early as well if you want to explore as much pier stops, or go for 2 days. It was a convenient way of exploring major tourist attractions, just walking distance near piers. Just pace/time yourself well, be mindful of the ferry schedule so you'd not be left behind and you'd be able to see the sunset while cruising. Start early as well if you want to explore as much pier stops, or go for 2 days. Ticejt was so easy to redeem and use! 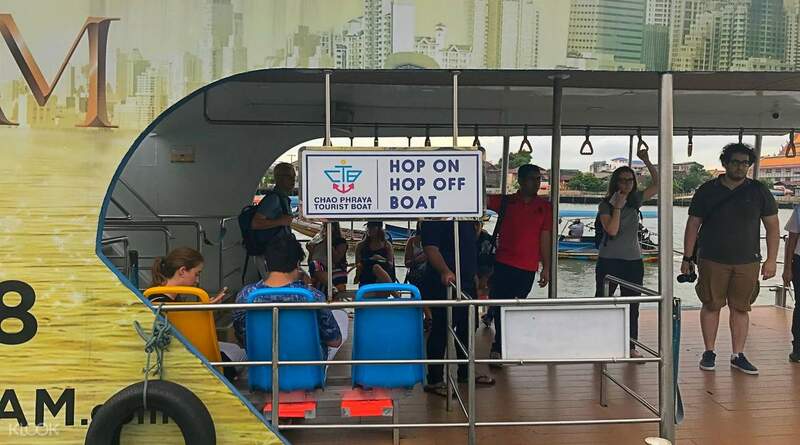 the hop on hop off ferry boat was so convinient to see the top attractions in Bangkok! Thanks Klook! Ticejt was so easy to redeem and use! 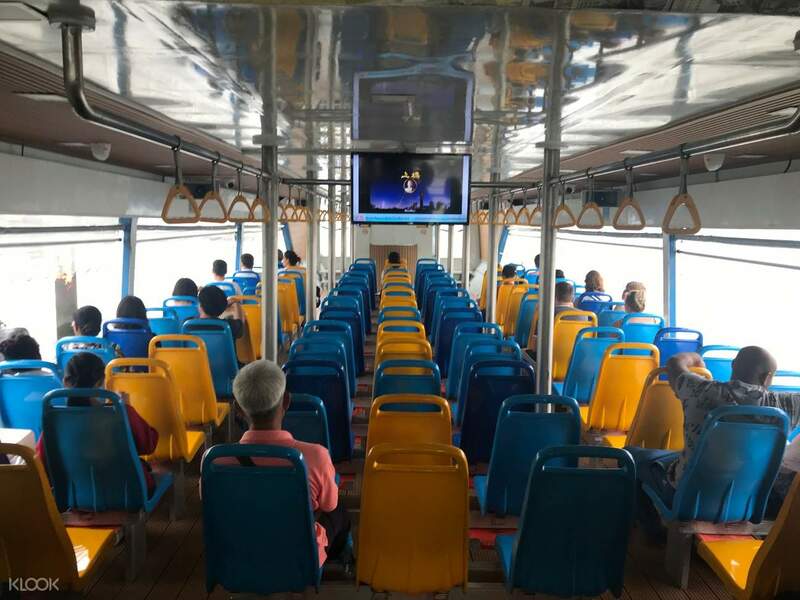 the hop on hop off ferry boat was so convinient to see the top attractions in Bangkok! Thanks Klook! the service waa great and the staff were supportive. some places are away from the pier and you have to walk for a long distance. the service waa great and the staff were supportive. some places are away from the pier and you have to walk for a long distance. A nice way to admire Bangkok's beautiful scenery and to explore places that are unreachable by other modes of transport! We went on a weekend and wasn't able to get a seat for most of the time. Nevertheless, the travelling time between each stop is rather short so it wasn't an issue! A nice way to admire Bangkok's beautiful scenery and to explore places that are unreachable by other modes of transport! We went on a weekend and wasn't able to get a seat for most of the time. Nevertheless, the travelling time between each stop is rather short so it wasn't an issue! Ticket collection at Tha Maharaj Pier was fast ...just show ur pass from ur mobile and they will produce the physical ticket. Enjoyed the boat ride and the view from the boat. The boat was on time as given in the schedule, only thing be prepared to get down at ur next stop especially if u are on the top deck. Very convenient for us to visit all the main temples, Grand Palace and Chinatown. Walking distance to the attractions. Just make sure you refer to the boat schedule. From Wat Arun, u need to take a ferry to cross the river to visit Wat Pho. 8 baht to and fro. Ticket collection at Tha Maharaj Pier was fast ...just show ur pass from ur mobile and they will produce the physical ticket. Enjoyed the boat ride and the view from the boat. The boat was on time as given in the schedule, only thing be prepared to get down at ur next stop especially if u are on the top deck. Very convenient for us to visit all the main temples, Grand Palace and Chinatown. Walking distance to the attractions. Just make sure you refer to the boat schedule. From Wat Arun, u need to take a ferry to cross the river to visit Wat Pho. 8 baht to and fro. We enjoyed it alot! Thank you Klook! Very Easy to find and their flexibility was exceptional. We enjoyed it alot! Thank you Klook! Very Easy to find and their flexibility was exceptional. Very friendly reception from the staff. I just let them see the klook QR code and they direct me immediately to the counter to scan. Well done service. I also enjoy every pier that I hop on. There's a lot of places you can visit along the river. Just need to prepare to be hot. but absolutely, not to be miss for any visitor. Very friendly reception from the staff. I just let them see the klook QR code and they direct me immediately to the counter to scan. Well done service. I also enjoy every pier that I hop on. There's a lot of places you can visit along the river. Just need to prepare to be hot. but absolutely, not to be miss for any visitor.